The Family Garden Trains Primer section was started in 1999 to encourage newcomers to garden railroading, and to help them avoid some pitfalls. Since then, the list of articles has grown and has benefitted from many suggestions, corrections, and additions, by industry leaders, professional gardeners, prominent hobbyists, and other authors and friends. Our goal is not to treat every subject, but to cover the 20% of information about garden railroading that 80% of all beginning garden railroaders need to know. If you want to know why we are making these articles available for free, please visit our article on "Why Our Content is Free". Please let us know if an article is helpful to you, or if you think it could be made more helpful, or if you need information on something we don't discuss. Also, if you would like to be notified by e-mail when a new articles are posted, please sign up for our free e-mail newsletter by clicking the green button at the right. In addition, please remember that all articles are for your personal use only; they are copyrighted by their respective authors and may not be copied without permission. Reference Information and Things to Think About - Miscellaneous topics that are important to most garden railroaders. Garden Railroad Planning Articles: - A new index to available resources. We have articles about planning the layout and infrastructure, the operational options, the kind of railroad, the "look and feel" of your garden and many more. Updated, October, 2008. A short list is provided below. For a complete list of our Planning articles, with descriptions, click here. 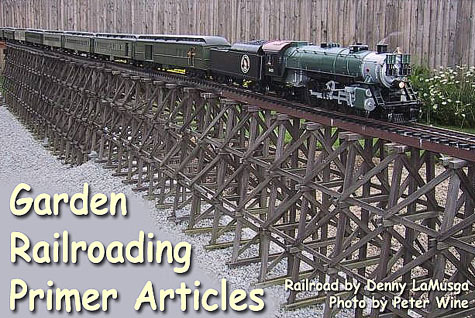 Garden Railroad Construction Articles - A new index to available resources. The articles in this section start easy, small, and temporary, and work toward more permanent and more elaborate. We also try to present new, cost-effective, and easy-to-use techniques in great detail, so even the most inexperienced gardener, landscaper, or carpenter can achieve permanent, quality results. A short list is provided below. For a complete list of our Construction articles, with descriptions, click here. 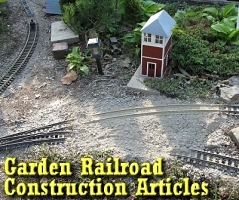 Introduction to Garden Railroad Construction - Updated, October, 2008. 1-Day Railroad - When You Have One Day to Build a Garden Railroad - Updated, October, 2008. How We Built Our Garden Railroads - January, 2004. New Article: Refurbishing Garden Railroad Roadbed - September, 2008. 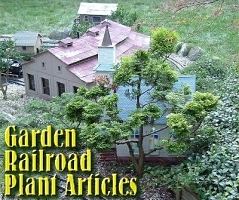 Garden Railroad Plant Articles: - A new index to available resources. We have articles about planning, planting, and cultivating the "garden" part of your garden railroad just like the "pros" do . . . well, actually, better than some of them. Updated, October, 2008 A short list is provided below. For a complete list of our Plant articles, with descriptions, click here. Dry-Setting a Paver Path - Ideas for walkways to, from, and past your garden railroad (and other places) - New October, 2008. 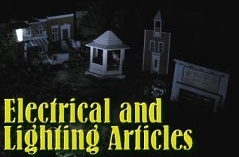 Electrical and Lighting Articles - Explanations and hints about electricity on a garden railroad, including lighting buildings, and powering and controlling your trains. A short list is provided below. For a complete list of our electrical and lighting articles, with descriptions, click here. 12 Volt Street Lamps from Specialty Light Strands - Use specialty garden-supply light strands to build working street lamps for a fraction of what they cost to buy. August, 2009. Ideas for Solar Lighting - Now's a good time to experiment with bringing light to the darkened corners of your railroad - Updated October, 2008. Free Project Wire from Bad Light Strands - a source of useful project wire for house lighting, etc., in from something you were going to away anyway - January, 2009. 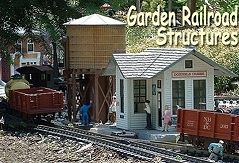 Garden Railroad Structures - A new index to available resources. We have articles about making conventional models more durable and realistic, and about creating buildings from unconventional (and inexpensive) materials, and much more. - Updated October, 2008. A short list is provided below. For a complete list of our Structure articles, with descriptions, click here. Structure Buyer's Guide - Technically, this isn't a primer page - it's a buyer's guide - but for 2013, we've added a nice selection of entry level building kits from multiple vendors, plus links to articles on painting and assembling those buildings. Stuff to Have on Hand - What to keep around so you're not always having to run to the store. Making Corrugated Metal Panels from Disposable Aluminum Pans - a cheap, quick, and effective way to produce attractive "corrugated steel" building materials - January, 2009. Converting an Artline Bird Feeder into a Gazebo - November, 2008. Cast in Concrete - Ben Hartman's Stone Houses - September, 2008. Part 5 - HDPE Expansion in the Nevada Summer - July, 2008. Part 6 - Additional Track Repair, Storage, and Wiring for TMCC - November, 2008. Thirty-Inch Railroading - The trains that "did more with less." Some 30" railroads provided all the functions of full-service common carriers on hastily-laid trackage that went boldly where no one else has gone before or since - New, April, 2008. Small but Mighty - 30" Power - The unique "real-world" steam locomotives that pulled 30" trains - May, 2008. The Little River Railroad - A standard-gauge logging railroad with common carrier aspirations. This Smoky Mountain railroad used compromises and combinations of equipment that hardly anyone would believe today if it wasn't for the photographs - August, 2008. Little River Railroad Northern Division Learn about the last and most unusual locomotive that ever ran on the Little River Railroad, now fully restored and running in south-central Michigan - October, 2008. Rail Cars and Busses on the Little River Railroad - with more modeling ideas for your own empire - March, 2009. Details for your Garden Railroad - Updated, October, 2008. Open House Checklist - Tips about preparing for and holding a garden railroad open house. Where Do I Go From Here? - Updated, April, 2008. If you want to get "down-and-dirty" technical details on most of the commonly used Large Scale locomotives and rolling stock, refer to George Shreyer's "Technical Tips Page". 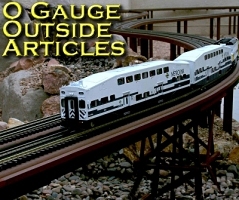 This page also reviews many power and control solutions for your locomotives, including DCC, Crest/AristoCraft Train Engineer, etc. In fact, George is an expert on several subjects and one of the hobby's most prolific writers. His resources should be important to you as your railroad grows. If you want some quick ideas for inexpensive and relatively easy scratchbuilding projects, look at Phil Creer's Toenail Ridge Shortline Articles Page. Note: Our Contents pages for Planning, Structures, etc., also include links to related articles on other sites we enjoy. Keep watching this space: We always have more articles in the "pipeline." *Note: In some cases, I also wanted to provide an authoritative reference to reduce some of the misunderstandings about issues like scale and gauge that have caused problems and even arguments. To that end, I sought and received the assistance of many industry professionals when putting together articles such as "Which Scale Should I Model?" Thanks again to all who participated.